The holidays are officially here. It is snowing outside (!!!) in Georgia as I type this. We occasionally have icy snow in February or so, but these are fluffy flakes that are melting as they hit the roadways but covering branches in white this morning. As a native southerner, I will never think it’s anything less than magical to see snow out my window. I’m drinking coffee to armor up for a long day of grading essays while the kids are at school, but I wanted to take a minute to write first. I took Norah to a Nutcracker tea party last weekend hosted by her ballet studio. We had treats and tea and watched the “big girls” perform Nutcracker variations. I caught a glimpse of her face watching them, and it is everything I love about ballet condensed to one expression – the awe and the dreaming and the bewilderment at the grace of it all. 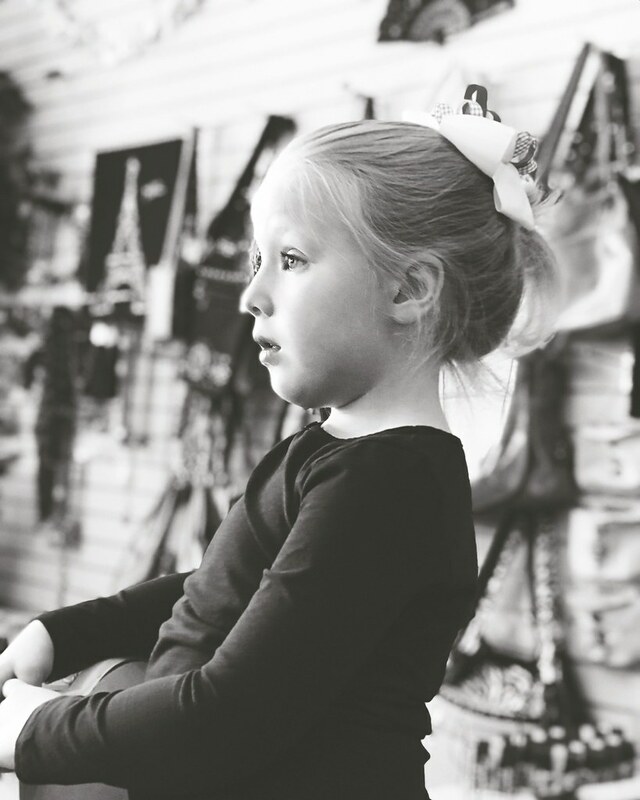 She watches the older girls practice in the studio sometimes and looks at them like they are celebrities. I try to use it as an opportunity to talk about hard work and perseverance, but she mainly just sees it as some kind of magic they have that she hopes to grasp one day. I see parallels there in my own self. 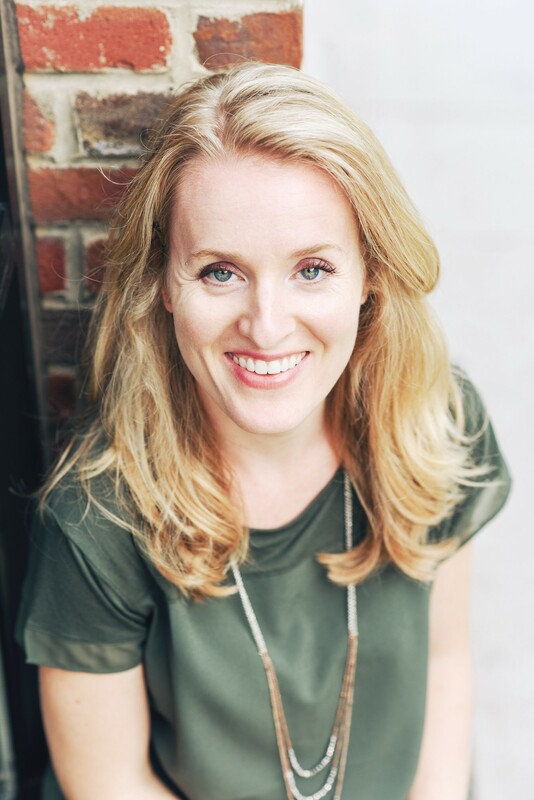 As humans, we tend to look at success in any area – career, health, relationships, anything – as some kind of magic sauce, but when we break anything down to see the smaller pieces, it’s clear that we make our own magic, don’t we? Or at least we make it bloom where the spark began. It starts like some magnetic thing we can’t quite put words to, and it grows when we decide to lean in and make it our own. 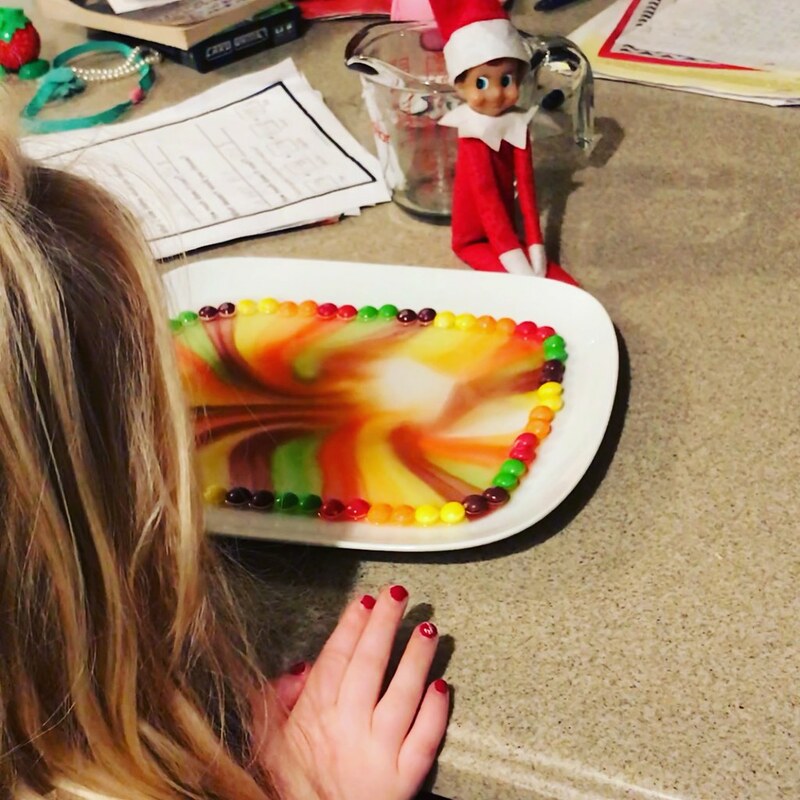 Our elf is not typically very exciting or creative, but he brought a skittle rainbow today. (I can’t take all the credit. I had help on this idea.) Both kids stood enamored this morning with their bed heads and sleepy eyes watching the colors swirl. 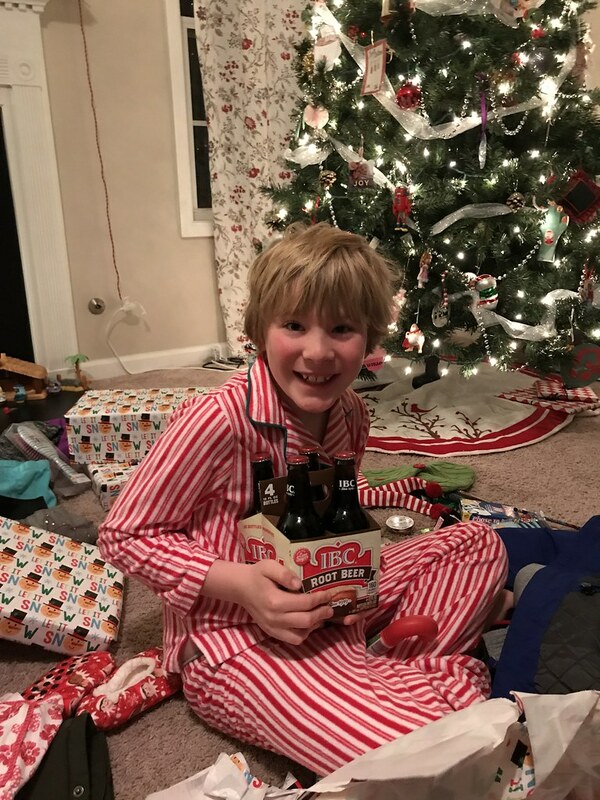 Seeing Christmas through the eyes of kids is such a reminder that enchantment is there for us if we are just willing to open our eyes to see it. And as a parent pulling all the strings, it also emphasizes my role in creating my life’s magic. It always requires leaning in a little past where I normally would, laying bare what I usually shy away from showing, and letting that spark ignite without judgement or expectation or cynicism. I think as I get older I am finally understanding that magic does not simply fall from the sky fully formed and ready to bestow itself on the lucky few. It starts with a spark, and it evolves to some kind of fascinating alchemy when we show up for our own lives with a true curiosity, a clear voice, and an open heart. 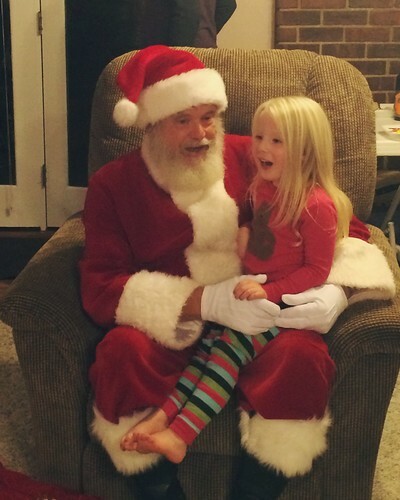 It’s December 26th, and sometimes I think this might be my favorite day of the year. I know a lot of people feel a Post-Christmas let down, but I love these days just after the release of the pressure of such a big holiday. Gifts are opened, schedules are still relaxed. We have no one to answer to, and everything feels a little looser and slower and more free in the very best way. Christmas morning last year felt so strange to me, waking in a quiet house with just the three of us. This year felt as worn and real and true as an old sweater. Jude was the last of the two of them to finally close his eyes at about 9:45 after hours of cousin excitement on Christmas Eve. I double-checked how soundly they were sleeping, listening for the tell tale slowed pace of their own breathing. And then I ventured to the garage to uncover all I’d hidden and begin to set it up. I stuffed my own stocking with a book and some chocolates and some fun bath oils so they don’t think Santa left me out. I set up their separate little piles and a few shared gifts in the middle. I didn’t feel the twinge of strange and lonely that I wrote about last year. This house is mine and this life is mine, and the further I get on this path, the more I love it. I don’t feel any void or missing piece when I am inside these walls. Just love and just us, the only way we know to be. 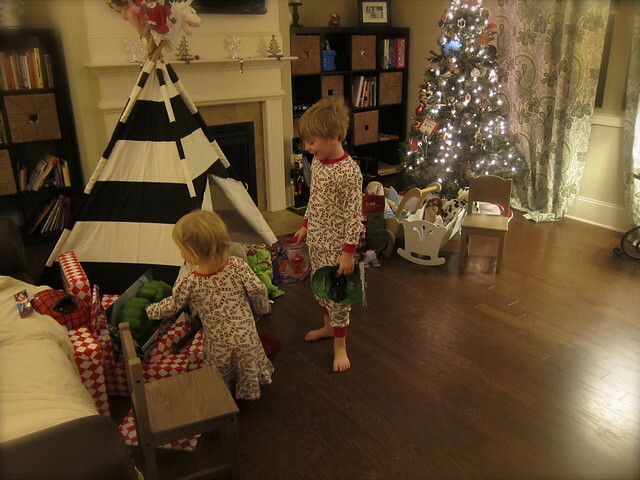 On Christmas day, they woke early and ripped into the packages as quickly as possible. They played while I avoided the mess and started on breakfast. My grandmother’s absence is humming under it all this year. Christmas does feel a little different without her here to guide me through it. But I made her food and I hung a few of her ornaments, and though my eyes water sometimes with the sting of loss, I can feel her here in such a real way sometimes. It’s that unique knife of both joy and sadness that pierces in the deepest place. I think when you sink deeper into those scary shades of loss and grief, it opens you up to feel that love and presence in a way you otherwise can’t. Feel the grief pierce you, sit with it a minute, and then you can feel the flow of love and memory and nostalgia and presence that comes after that stillness. I breathe it in as deeply as I can, and I say thank you. What a year this has been. The news broke last night about George Michael, and the list he’s joining is such a long one – David Bowie, Alan Rickman, Leon Russell, Harper Lee, Prince, Merle Haggard, Gene Wilder, Leonard Cohen. Art never ends though, does it? After the news broke on each of those, I heard others reminisce on lines or films or songs or concerts or occasions that always reside in the back of our memories somewhere and firmly attach to our own life experiences. It’s wild, isn’t it? The way someone’s influence rolls into the million things that creates who you are and shapes how you see the world. I was a dance kid in the 90’s, so of course I have my soundtrack of George Michael songs and moments buried in my own field of nostalgia. “Freedom 90” was such an anthem of joy and fun when I was younger. In dance dressing rooms or teenage bedrooms covered in posters or in cars with the windows down when we wanted a little nostalgia. I still never tire of that song, but I hear those lines now with a frequency I didn’t before as 35 years of life and loss have softened and weathered me. Today the way I play the game is not the same, no way…All we have to do now is take these lies and make them true somehow. Make it true, make it true, make it true. It’s the only way to freedom, and now I see that. The truth is in the center, and it always rises to the top eventually anyway. You cannot avoid it. But life is shaping me continually to help me get to that center with more ease than ever before, breaking the shell of whatever is on the outside and reaching the pocket of truth in the middle. As 2016 is coming to a close, I feel so much gratitude for the life that’s lead me to this place and the ways I’ve learned to carve away the outside layers, reach what matters, and reflect that authenticity back to the faces of those I see everyday. As I look ahead to 2017, I think I can see that this is where it gets fun. This is where the reward comes. I have learned through life and loss how to create a life that is true, and now I get to watch it take shape in ways that are not always perfect, ever evolving, and always surprising. But they are all true and all real and all mine. I said I’m taking a break, and that is still the case. I’ve been doing my writing elsewhere and I’ll return to more regular posting soon. But this is my journal – with every major moment of my past 5 or more years chronicled here. I’m writing here tonight to look back and remember, to fill in the spaces when I look through the eye of nostalgia to piece it all back together. It’s almost midnight on Christmas Eve. The house is quiet. The kids are upstairs asleep, and the presents are laid out by the tree. It’s 64 degrees outside, even now at this hour. We wore short sleeves today. It’s raining, and we are sleeping with the windows open on Christmas Eve. It doesn’t feel like Christmas this year. The timing of my major life shift sort of straddled across two years. It was November of 2014 when it all exploded, and last year was the hardest Christmas of my life, hands down. It was right in the middle of the eight week stretch when I cried every single day. Everyday. 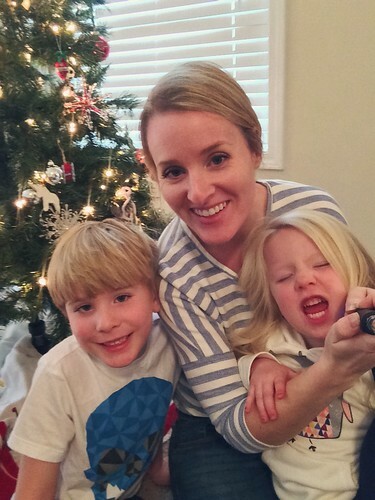 This year is easier, but it is still my first Christmas on my own with the kids. In a new house – with everything else new as well. The last of many firsts. We are about to turn the page past the firsts, and I am so ready. It’s so much this time of year – Christmas and the closing of one year and the dawn of another. It’s no accident that it falls in line with the winter solstice as well (on this side of the globe anyway). The contrast of the darkest day of the year punctuated with little twinkling lights everywhere. Joy works that way as well, I think. Powered by gratitude and mindfulness, it twinkles and shines through the mud of whatever is aching you. We made cookies this afternoon. The kids played loudly upstairs while I finished up some kitchen tasks, and they were exploding with excitement all afternoon. We went to my grandparents’ house where I have spent each and every Christmas Eve of my 34 years. We ate and laughed and talked above the chaos of happy kids. My two played with their cousins in the same way I played with mine more than two decades ago. So much has changed, and so much has stayed the same. We drove home, bellies full. The kids looked at Christmas lights out the car windows. 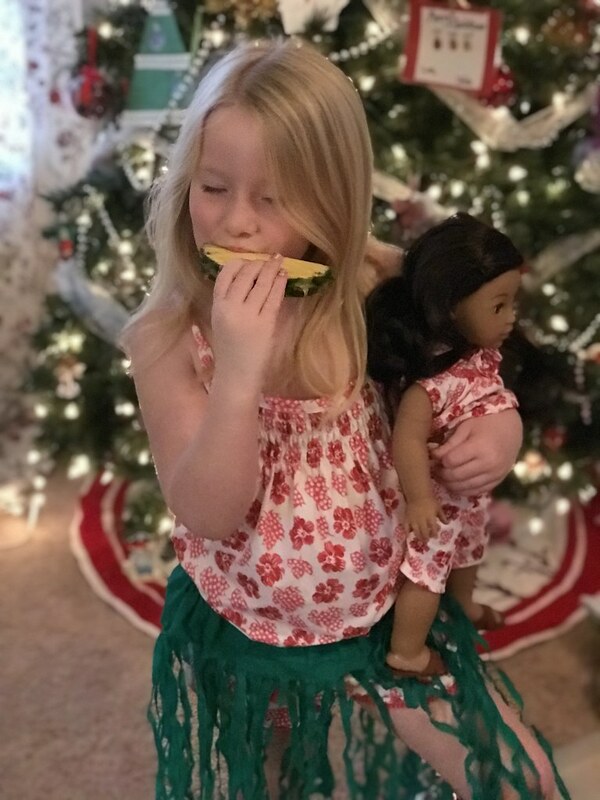 They brushed their teeth when we got home and then set out a snack for Santa and headed straight to bed. We huddled, all three of us, in my big bed with the window open in this bizarre rainy heat wave. Norah fell asleep first, and Jude was almost there but jolted up for a minute when the dog shook his collar. I thought that was a reindeer, mama. I kissed his head, he finally fell asleep, and I came downstairs to set up gifts and record a few things here for you – and mostly just for me. I’m grateful for every single minute. All of it. This Christmas, more than ever, I feel broken but also whole and real. And I see the light unfolding in front of me. The lights are flickering in the smallest of spaces, and this is the beginning. Thanksgiving came and went, and Christmas time is here. I know this is cliche, but how is 2015 nearly over already? I can hardly believe tomorrow begins December. 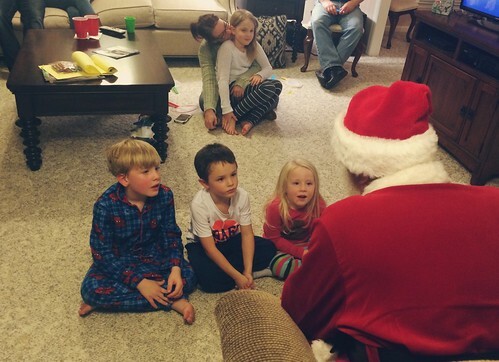 My mom indulged my kids and all their little cousins with a pretty fun surprise on Thanksgiving night as we celebrated at my grandparents’ house. 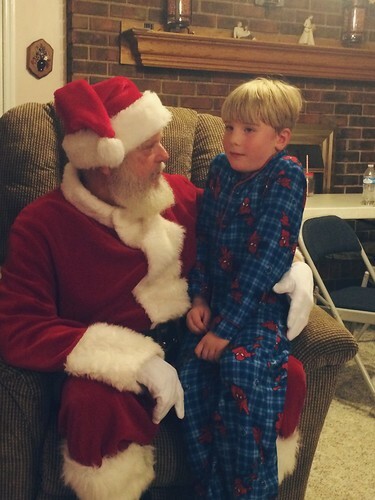 My normally energetic boy got pretty shy when it was his turn to talk to Santa. 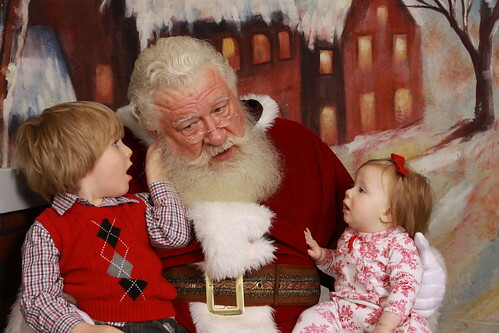 But Norah talked his ear off as expected. Like most siblings, my two are opposite in so many ways. We drove home in the dark seeing a few houses already lit up, and they talked a mile a minute – about Christmas and Santa and a million other things. I thought for sure they’d be asleep by the time we got home, but they weren’t. 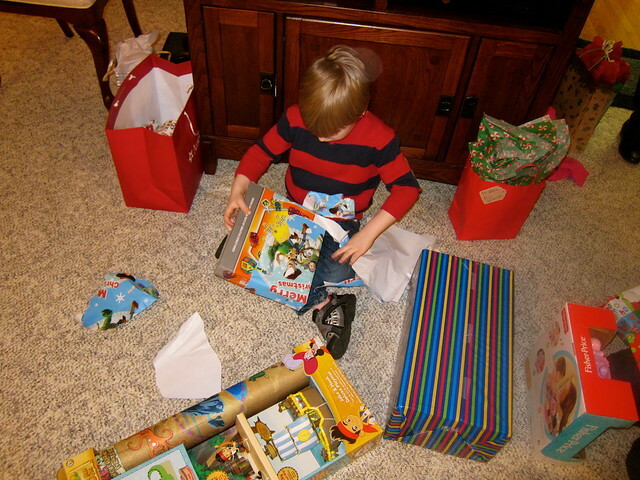 The holidays bring so much wonder and excitement for kids. It brings it all back in the best way. They spent the next couple of days with their dad, and I got to use the time to wrap up some grading piles and get out the decor. 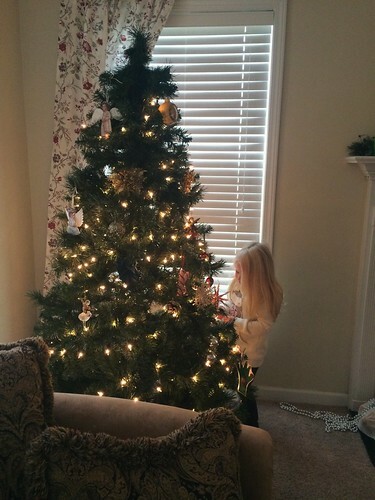 When they arrived home on Sunday morning, we got started on the tree. It’s little and covered with kid-crafted things and nothing is symmetrical, but it’s ours. Our little tree and our little house. And a house never feels as cozy as when it’s twinkling inside with Christmas lights. 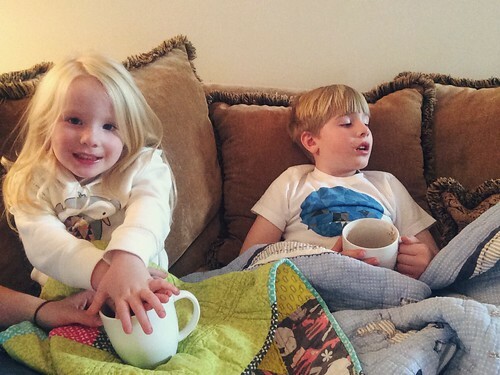 We finished the afternoon with hot chocolate and a movie, and they were content and happy. Tonight I’m filling the Advent calendar with our little activities for the month of December, gems we can enjoy everyday for the next few weeks…. 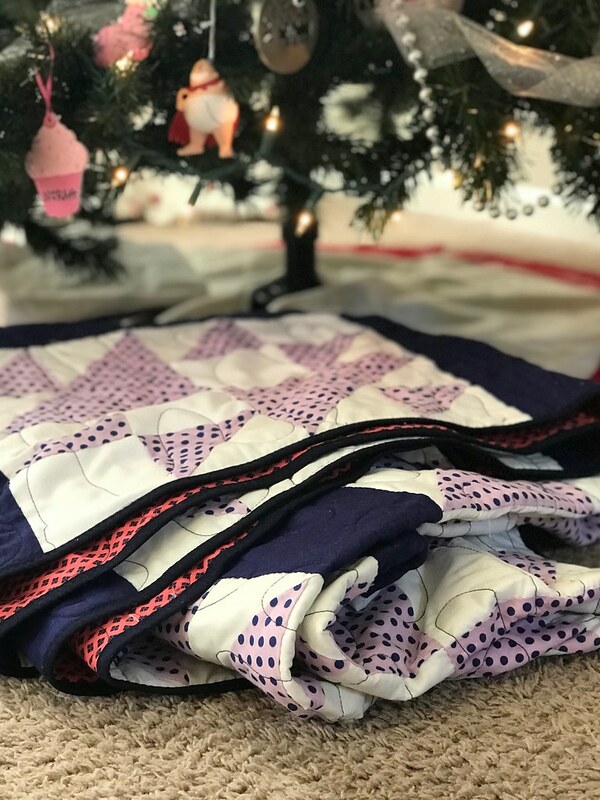 make cards for your teachers, eat pancakes for dinner, wrap a present, go driving in pj’s and look at Christmas lights…. The smallest things can make them so happy. And me, too. I see the value of tradition during the holidays more than ever. These are the moments they will remember as they grow, and that idea of creating memories for your kids is both the heaviest and the most beautiful part of motherhood to me. I’m creating the soundtrack and images that will replay for them in moments of nostalgia decades from now. And truthfully I don’t even know what will stick, what will survive the years and emerge as the things they love the most. 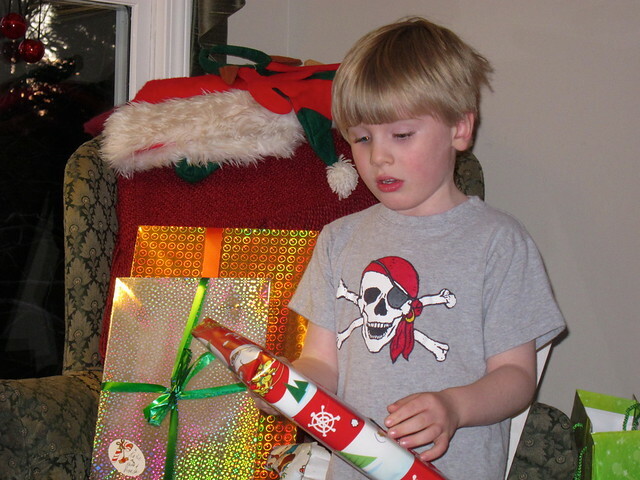 It’s the smallest things that they seem to remember so far – never the gifts under the tree. It’s the moments shared among the three of us that are creating a home and a life for them. I hope I can calm myself for a few sacred minutes everyday in this last stretch of 2015 to remember that. I look around and see so much comfort and abundance. This is it. Not a year into the future and certainly not my past. This is life as it’s really happening and not a stepping stone to something else. I’m grateful for all of it – for the two little people I get to share these traditions with and for all the magic that December holds. I ended the day yesterday with a few quiet moments as Norah slept and Jude and Scott were somehow still building with Legos. (At 10:26 pm!) I had time to take a look at photos from the camera while deliberately ignoring the heaps of toys and mess all over the house. 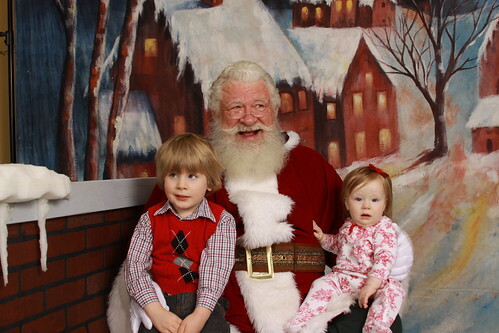 There were very few still and quiet moments this year with two kids at these ages. I find myself wanting to record a few details about this Christmas before I forget and life speeds to another season. Christmas Eve had us at my grandparents’ home. I have spent every single Christmas Eve of my life there, not even missing one. 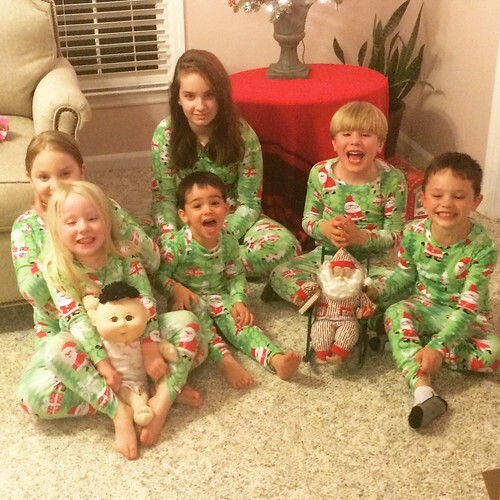 The same house, the same faces and voices – rooms full of loud cousins and noisy siblings. Norah and Jude fed off the excitement the same way I did as a child, and watching them brought back so many of my own memories. Try as we might to get children to understand the meaning of the season, it is PRESENTS PRESENTS PRESENTS at these ages, and I am totally okay with it. What better way to learn to understand love and generosity than to first understand what a joy it is to receive and give? 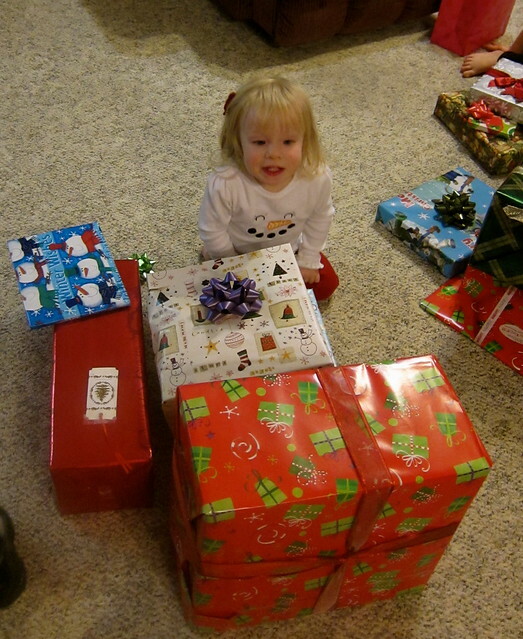 They were so enthused about each and every package this year. 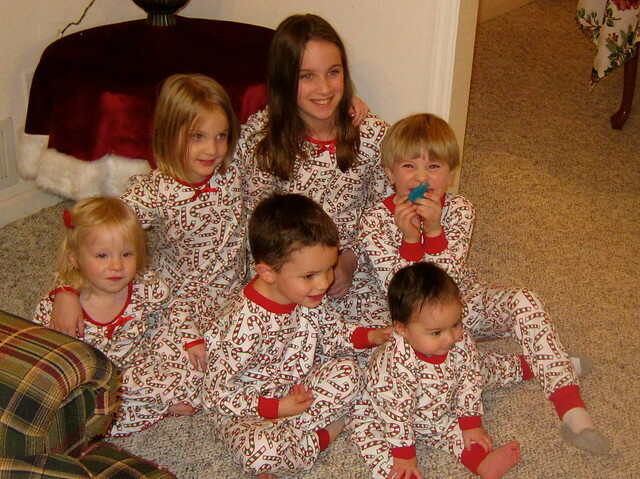 I watched them with their cousins, aunts and uncles, grandparents, and great-grandparents. Family ties feel so much stronger during the holidays somehow, don’t they? By the time we got home Christmas Eve, it was something like 9:30. Add getting the kids in bed and the car unloaded, and I felt depleted. 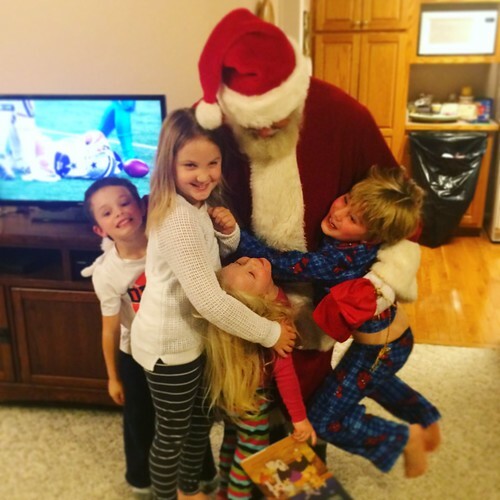 But the second you start getting ready to play Santa, you get a burst of energy because really and truly, there are not many things about parenthood that are as fun as Christmas morning. That unadulterated joy and genuine excitement when two pajama-clad kids walk down the stairs? Priceless. 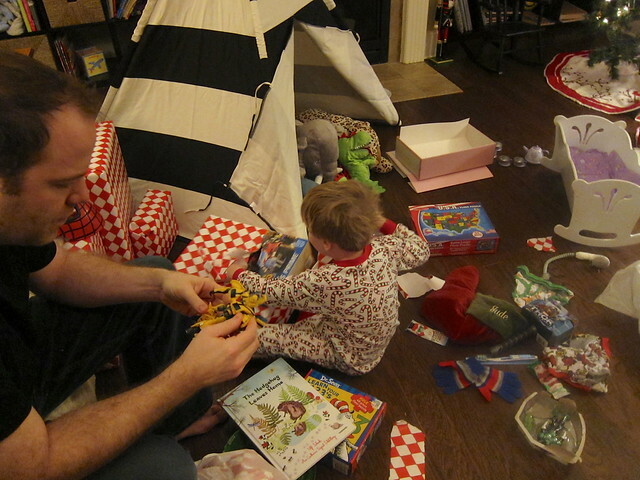 I found an awesome play teepee on Land of Nod, and Norah’s toys were mostly baby dolls this year with a stroller and a cradle, while Jude got Lego sets and Transformers which have only allowed him to come downstairs for a moment to grab lunch. 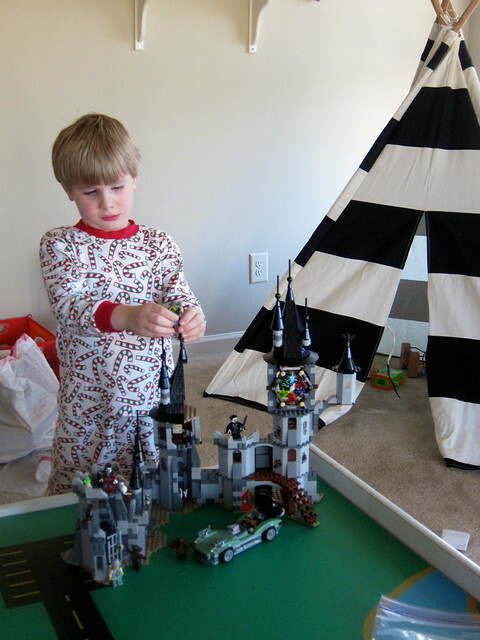 He LOVES building sets and such. It astounds me. 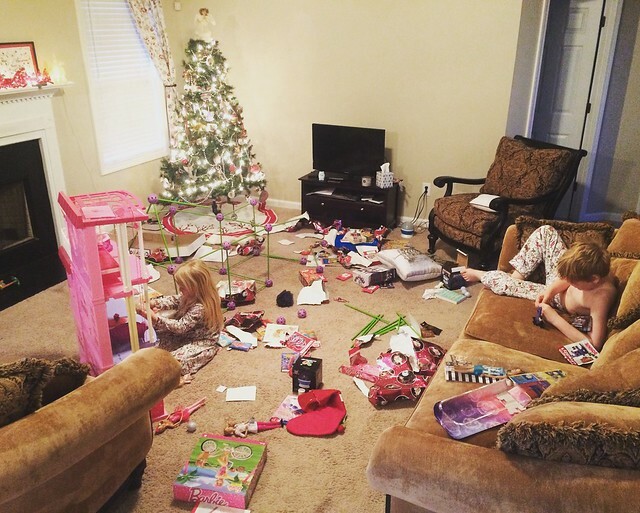 For a moment, I think I got a glimpse of what Christmas morning will feel like in another five years when they rip into presents and stay busy all day while I crack open a book for some leisure time (what is that!?) 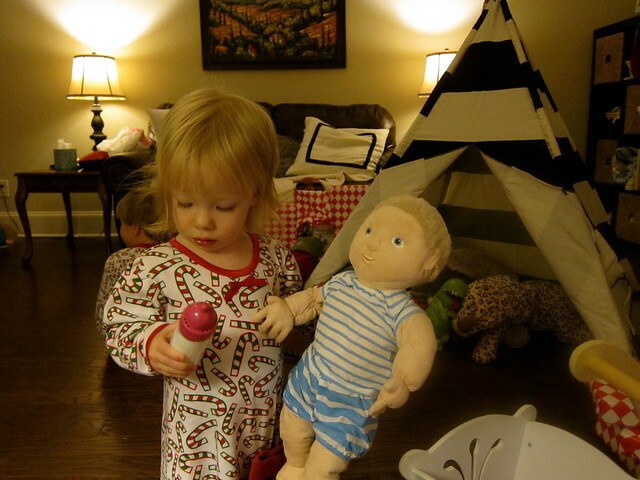 This year had me burping and feeding baby dolls until Norah’s nap time though. I’m okay with the attention she needs seeing how fast Jude has grown and how independent he has become this year. After naptime, we headed over to my in-laws for round three. Lots of craziness with four under five, but they loved it. It’s such an intense season of parenting we’re in right now. But I know for certain that God sees it best to reward your extra efforts with such big doses of magic. Am I sleep-deprived and exhausted and rarely organized? Yes. 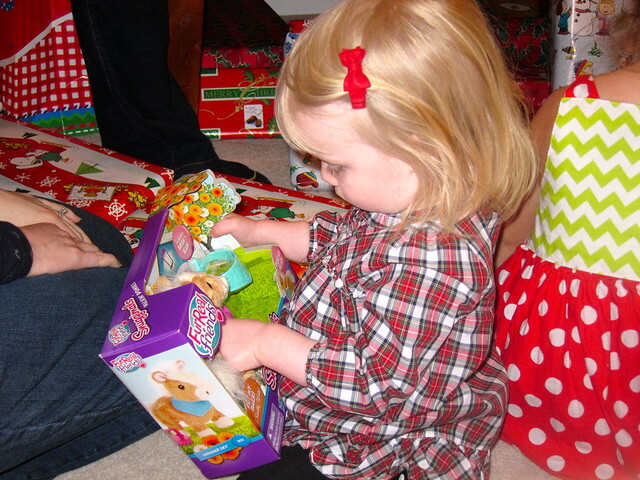 But these years of believing in magic without question and being so impressed with even the tiniest toys and gifts? 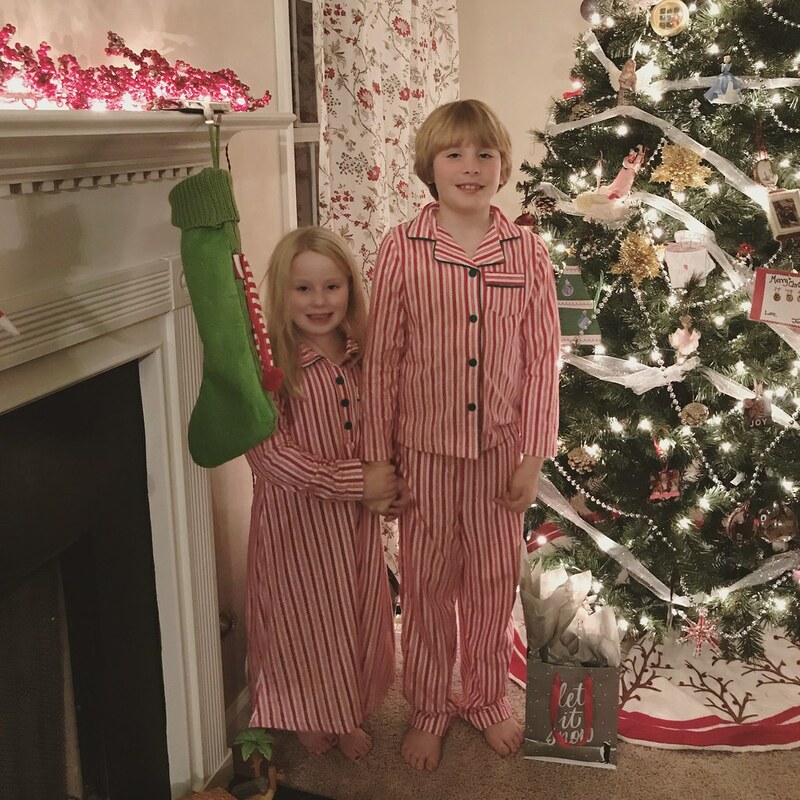 I know they are short, and while my holidays will be far more relaxed one day soon enough, I get to see Christmas through the eyes of these two right now, and it really is a pretty magical sight. Happy Christmas to you and yours, and I wish you the best in the last days of 2013. The end of the year always has me a little reflective and, honestly, a little sad. Life is sweet, and each year is precious. Make the most of this one. Happy Holidays, friends! Praying for peace on Earth and in the hearts of all of us. 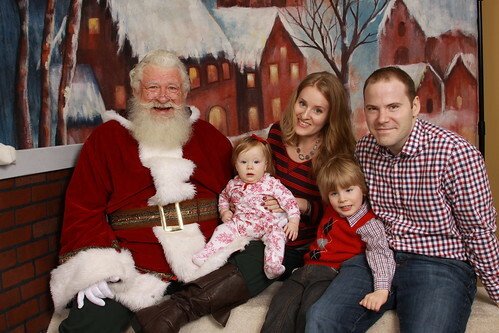 We went to see Santa on Monday. 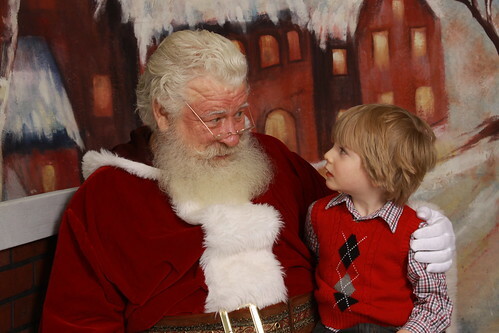 Jude was super bashful, but I think he soon realized that he needed to chat with the big man and impress him if he wanted those presents. Some of these pictures really make me laugh. 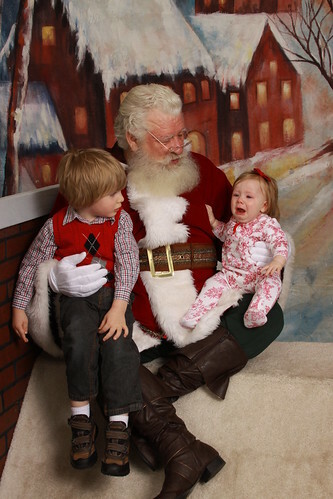 And then poor little Norah. 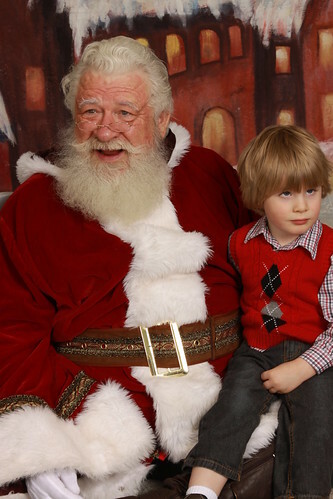 This Santa thing is pretty weird and scary when you really stop to think about it. She cried for a minute and then warmed up. We got some classic photos. We even got a couple of cheesy ones with the whole family. Jude is asking for a violin and “pirate stuff.” Occasionally he will add “Darth Vader underwear” to that list, but the violin seems to be the top priority for him. 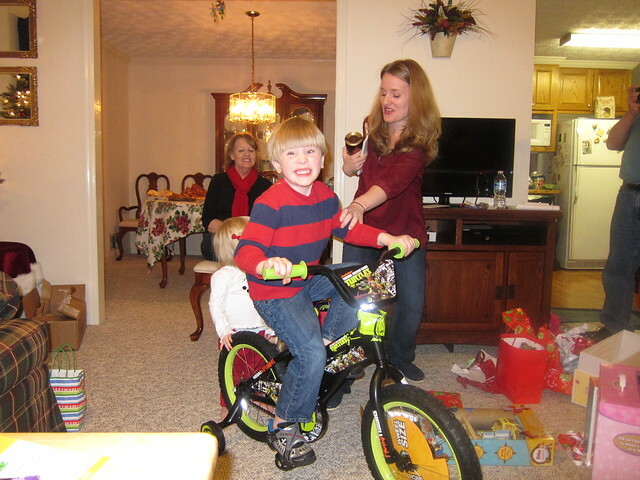 I’m counting down to Christmas morning to see the look on his face for sure. 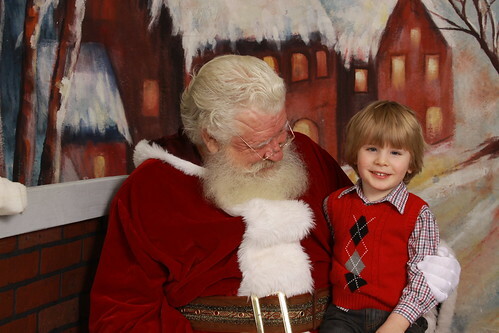 Three is the perfect age for Christmas magic. He loves it all. Tonight is the Christmas pageant at his little preschool. I can’t imagine my boy being still for more than twenty seconds, so we’ll see how it goes. Either way, it will be entertaining for sure. I hope your Christmas season is in full swing and you’re enjoying these last few weeks of the year!